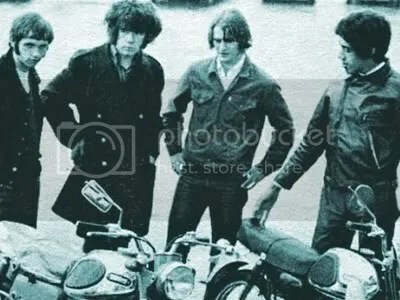 According to Bravewords.com, Late THIN LIZZY guitarist GARY MOORE’s debut album Back On The Streets – featuring Thin Lizzy’s Phil Lynott and Brian Downey – is now available as an extended edition featuring the original album plus bonus B-sides and alternate versions. For complete details and to purchase go to Amazon.co.uk here. Now Gibson USA honors this certified guitar legend with the Gary Moore Les Paul Standard, a first-class Les Paul decked out to this demanding artist’s preferred specifications. Many details are reminiscent of the famed Peter Green Les Paul, formerly played by Gary Moore and now owned by collector Melvyn Franks. From its highly flamed maple top with Lemonburst finish, to its traditional Les Paul Model headstock with signature truss-rod cover, to its mismatched amber and gold top-hat knobs, the Gary Moore Les Paul Standard offers uncompromising looks. Plug in and fire up its BurstBucker Pro humbucking pickups via Orange Drop tone caps, all anchored with a quality TonePros hardware, and it rips it up with a tone fit to carry the name, Gary Moore. For more details visit Gibson.com. Moore suffered a heart attack brought on by a massive amount of alcohol he consumed prior to being found dead in bed at a luxury hotel in Spain in February 2011 and was put to rest in Saltdean, East Sussex. Moore‘s family spokesman issued a statement to the paper explaining that adverse weather conditions were to blame for the delay in erecting a headstone. An exhibition celebrating the life and work of legendary guitarist Gary Moore has been launched at the Oh Yeah Music Centre in Belfast, United Kingdom. 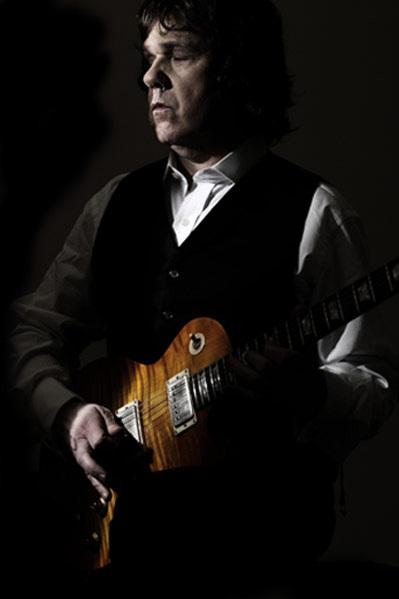 Gary Moore was an exceptional guitarist, songwriter and performer. His solo records are internationally admired, likewise his work with the likes of THIN LIZZY, SKID ROW, THE TRAVELLING WILBURYS, BB King and George Harrison. Gary was born in Belfast on April 4, 1952. Sadly, he passed away on February 6, 2011. To mark what would have been his 60th birthday, the family of Gary Moore is helping with a unique exhibition of his personal effects. * A suit, shirt and shoes, specially commissioned by the tailor Gresham Blake for an Amnesty International event. * A series of gold albums, framed magazine covers, signed photos, tour passes, posters and flyers. * A mounted brick from the Martime Hotel, Belfast, presented by the Belfast Blues Society to Gary. * Plus many more effects. This is the first of a series of events that will mark the legendary achievements of Gary Moore. For more information, visit www.ohyeahbelfast.com. Gary Moore suffered a heart attack brought on by a massive amount of alcohol he consumed prior to being found dead in bed at a luxury Costa del Sol hotel in February 2011. In a recent interview with GuitarWorld.com, legendary vocalist/bassist Glenn Hughes (BLACK COUNTRY COMMUNION, DEEP PURPLE, BLACK SABBATH) was asked about his memories of the late guitarist Gary Moore. “Gary and I became very good friends in 1980,” Glenn replied. “He left a THIN LIZZY tour midway through. He just disappeared — but he actually disappeared to my house. He couldn’t take playing in a band anymore, and he had this tendency to just jump ship. I remember Phil Lynott calling my house and saying, ‘If you’ve got him over there, I’m gonna slit your throat.’ The idea of someone slitting my throat didn’t make me happy. “Gary and I formed this little combo called G FORCE. As soon as it started, I was out of it because I was too drunk. But we were still great friends in the early ’80s, and I joined him to do an album called ‘Run For Cover’. But I was drunk again, and it wasn’t the appropriate time to work with Gary because he was against all druggy behavior at the time. According to The Telegraph, Gary Moore suffered a heart attack brought on by a massive amount of alcohol he consumed prior to being found dead in bed at a luxury Costa del Sol hotel in February 2011. Moore had 380 mg of alcohol per deciliter of blood in his system, enough to put himself nearly five times over the the legal limit for drunk driving, tests have shown. That amount was just short of the 416 mg pop singer Amy Winehouse had in her body when she died surrounded by three empty vodka bottles. According to The Telegraph, legendary guitarist Gary Moore suffered a heart attack brought on by a massive amount of alcohol he consumed prior to being found dead in bed at a luxury Costa del Sol hotel last February. Karen Rice of the U.K.’s Mail Online last year penned an extensive article detailing Moore‘s final days with his girlfriend Petra Nioduschewski, who was the last person to see Gary alive at the five-star Kempinski resort on the Costa del Sol in Spain. A hotel source told the Mail Online, “At around four o’clock in the morning [on Sunday, February 6], [Petra] called for help and a security guard went to the room and found Gary on the bed in his underpants. According to Rock News Desk, the musician who played with Phil Lynott and Gary Moore in Irish 1960s band SKID ROW has explained his frustration over the US outfit once fronted by Sebastian Bach taking his name. And he says long-standing stories about Moore having been paid by Jon Bon Jovi for the name are untrue. Brush Shiels founded his blues-rock act in 1967, and gave Moore his first professional music role. They toured across the US and Canada and released three albums before splitting in 1972. He’s continued using the Skid Row name and is poised to release a new record under the title. But he’s issued a plea for Jon Bon Jovi or his management to contact him and explain what happened when they decided to call Bach’s band Skid Row in 1986. Shiels says: “Philo, Gary and myself toured America, playing with FRANK ZAPPA, THE ALLMAN BROTHERS, IGGY AND THE STOOGES. ROD STEWART and THE FACES never turned up so we topped the bill. Everybody knew us. “A couple of years ago, I’m looking at MTV and Sebastian Bach, the ex-singer of the American band Skid Row. He said they paid Gary Moore $35,000 for the use of the name. “Now, I know for a fact this is a complete lie. I got in touch with Seb, and he said as far as he was concerned it was the truth. But that couldn’t be the truth. Read more at Rock News Desk.